Cost is $120 per adult. 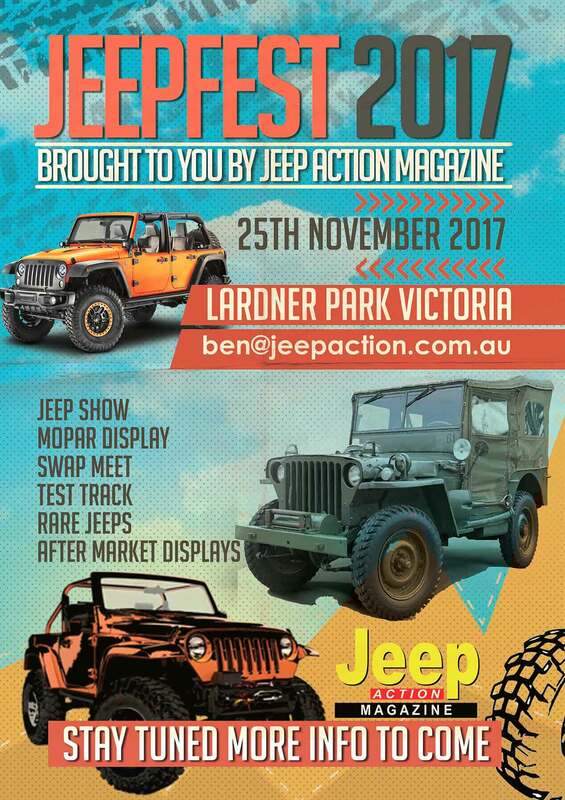 Jeep Action Magazine proudly hosts Camp Coffs 2018. Please note that you must be a subscriber to the magazine to attend. A Jeep only, family orientated event held every year by Jeep Action Magazine in the Coffs Harbour NSW area. The event revolves around different graded trips led by local Jeepers going out each day. Afternoons and evenings are socializing with trip briefings, prizes and raffles. Your subscription covers you and your partner and two Jeeps. But each adult is $120 (this includes partner). Thats $120 for every adult. Yes, to ensure we continue to hold a well organised and successful event, registrations numbers will be limited. It will be first in first registered. There are definitely no registrations at camp. Please register online and remember registrations are limited, remember to bring your registration paper work with you. Camp Coffs is based at a rural showground. Camping facility are flushing toilets and hot showers, these can get busy at peak times. There is on-site catering with meals for purchase and plenty of room for the kids to run around. There is camping room for vans, campers, tents and swags. Camp is not open till 8am on Thursday. You can camp in Coffs Harbour on the Wednesday night and arrive Thursday morning. Please don’t ask for early entry as we will be setting up till the open time and our insurance starts then. Yes, on leads at all times, cleaned up after, quiet at nights and consideration towards other campers. Sponsors for Jeep events are very welcome. Do get in touch using the contact form “Get in Touch” on the right side of this page if you would like to advertise your products or services in the magazine and or for any upcoming Jeep events. Please email us and Michael will send our Media Kit – Thankyou. For each subscription to the Printed magazine you are eligible to place 2 free listings in the Jeep Action Classifieds. Images and details of the Jeep or Off road items for sale should be sent to Michael also – please also let us know your email address so we can verify your subscription. eMagazine subscribers are entitled to a single listing in the Classifieds. We will have much more detail to come here on the “our sponsors” page featuring our advertisers and Jeep supporters – we couldn’t survive without them. 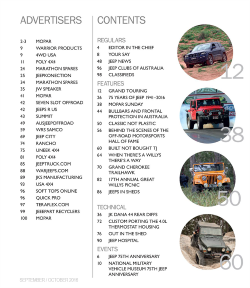 You can always see the advertisers/sponsors list on page 5 of every edition of Jeep Action Magazine with details of their contact and products in the magazine. 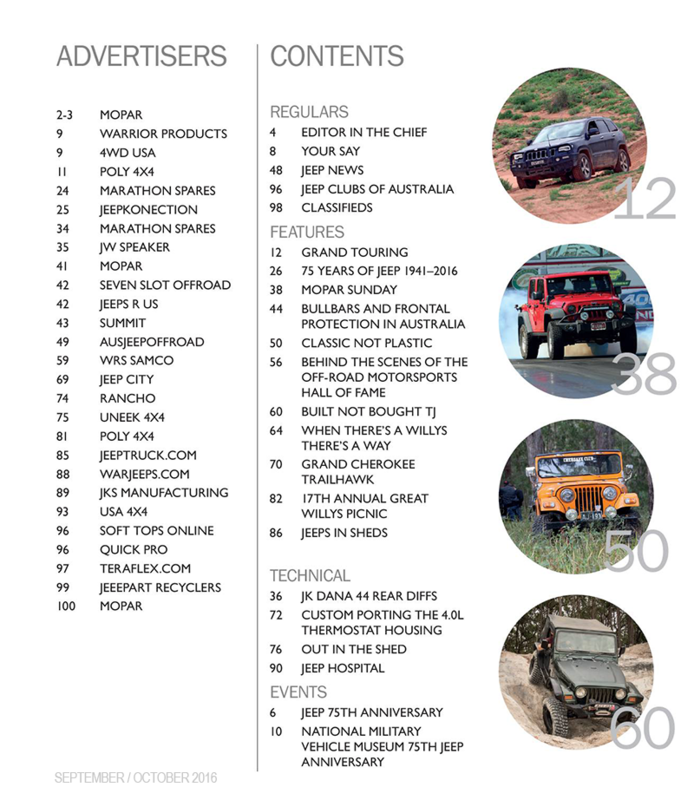 A sample basic list of our advertisers as shown in each edition is here. Problems logging into this new look site? Login to this site is only available after a new registration, a purchase or renewal of your printed sub. To register or login if you have recently renewed to the Printed magazine use this link. Get in touch if you have any further questions regarding this. Use the link to login with your email and the password. This opens a new window and takes you the Archived eMags. They will always be there for you! Subscription renewal – are they automatic? For printed magazine renewals you will receive an email letting you know your Jeep Action subscription is due for renewing. You can then visit the website site and renew. For eMagazines each platform enables auto renewals via iTunes or Pocket Mags. You have the option to enable this yourself – its not made as auto renewed by default. eMagazine Options include an App from iTunes or for all other eMagazine access we now use pocket mags. For current eMagazine subscribers (you are now officially “legends”), go here to login as usual. From September 1st 2016 renewals and new eMagazine subscriptions we use either of these options. When using Pocket Mags and paying with a Credit Card, an additional $00.18 cent processing fee is charged by Pocket Mags (for a normal $19.99, 12 month subscription).